The Eric Benny and Co will also conduct a 4x4 football league in the State to promote the game from grassroots. Telangana Football Association (from left) secretary G Palguna, president Md Ali Rafat, Eric Benny and TFA chairman KT Mahi during an event on Thursday. Hyderabad: Eric Benny Sports Management company, run by former Indian player and ex manager of the Indian team Eric Benny, has collaborated with Telangana Football Association (TFA) to develop the game of football in the State from grassroots. In this regard, the company has selected five school children -Shaliyanth Reddy, Mayank, Aryan, Saranga Pagadala and Smarna Ravela – from the city for a training stint with a German football club. The Eric Benny and Co will also conduct a 4×4 football league in the State to promote the game from grassroots. 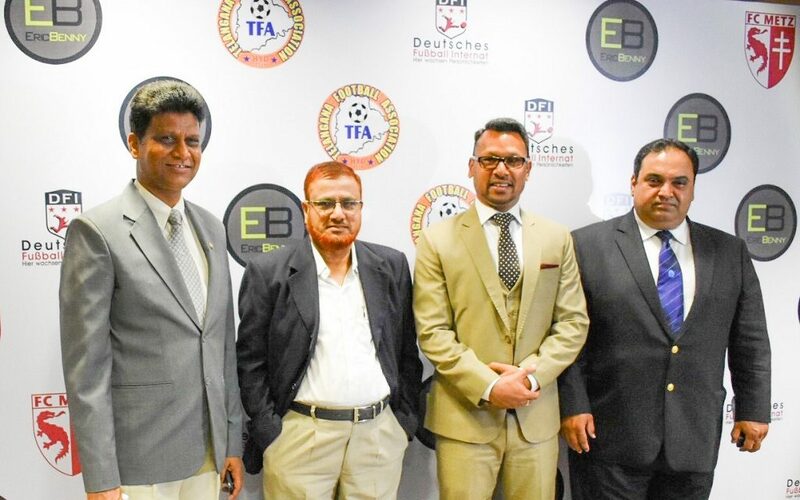 TFA president Md Ali Rafat said that the city of Nizams was the hub of the Indian football in the olden days and the game has suffered because of the political turmoil in the association. “We have more than half of the Indian teams that participated in 1948, 52, 56 and 60 Olympics. But there was no football in the last 13 to 14 years because of the power politics. The game has seen revival in last three years. We are determined to change the game’s fate. We promise our full cooperation to Eric for the game’s development,” he said. TFA secretary G Palguna also batted for financial assistance to the game. “We do not have financial support either from State government or All India Football Federation (AIFF). We need more facilities and stadia in twin cities and also in the districts,” he added.